BOB ABERNETHY, anchor: Now, a report on an army boot camp for chaplains where they learn to carry out their ministry within the military culture. They’ve already been ordained in their own faith traditions, but the Army recognizes more than a hundred religious groups within its ranks, and it wants its chaplains alert to the potential dangers of evangelizing — and even religious discrimination. Saul Gonzalez reports from Fort Jackson, South Carolina. SAUL GONZALEZ: At Fort Jackson, South Carolina, soldiers train for the dangers of Iraq and Afghanistan. SOLDIER #1 (shouting): Go. Go. Go. Go. Go! GONZALEZ: This afternoon it’s a simulated insurgent ambush on a military convoy. SOLDIER #2: Combat base, this is Charlie One. Copy that. GONZALEZ: But many of the troops in this exercise, the ones not carrying weapons, aren’t warriors. They’re members of the clergy attending the Army’s boot camp for chaplains. Colonel CLARKE MCGRIFF: (Commandant, U.S. Army Chaplain Center and School): So we are not a theological school, but we take theologians and train them on how to provide or perform religious support in an Army setting. GONZALEZ: Colonel Clarke McGriff, an American Baptist minister, is the commandant of the U.S. Army Chaplain Center and School. It teaches new Army chaplains who have already been ordained by their own religious bodies the rules and customs of Army life. Col. MCGRIFF: The Army is a world of its own, and we walk, we talk, we do things in a peculiar way, and for a chaplain and a chaplain assistant to be effective in that environment they each must have the understanding of the codes, the lingo, the particular battle rhythm that the people that they’re serving have as well. GONZALEZ: Much of the school’s 12-week long curriculum emphasizes battlefield skills, from how to react while under fire to administering first aid and moving wounded soldiers. ARMY TRAINER: And you just gently ease him down. Lieutenant Colonel MARC GAUTHIER: The biggest question is if they deploy to Iraq or Afghanistan is their survivability on the battlefield. GONZALEZ: Chaplain and Lieutenant Colonel Marc Gauthier plans and manages training at the school. Lt. Col. GAUTHIER (Chaplain Training Officer, U.S. Army): The expectation is they already have the ministry skills understood, and what we are trying to do is teach them to learn military skills to make both those things match together so they provide effective care to soldiers and families and provide effective ministry. CHAPLAIN ASSISTANT: Behind me, behind me, Chaplain. GONZALEZ: Since military chaplains are classified as noncombatants they don’t carry weapons on the battlefield. Armed and unordained chaplain assistants, who also train at Fort Jackson, provide protection for the military clergy. ARMY INSTRUCTOR #1: Conduct yourself with dignity and honor and comply with the law of war. GONZALEZ: New Army chaplains say they’ve joined the military as a way to serve both their faith and country. Chaplain MIKE SMITH (U.S. Army): I’m giving every soldier the opportunity to learn about God, to get a source of faith and hope that they may not get. GONZALEZ: Before becoming a Baptist minister, Mike Smith had been an enlisted Marine and Florida police officer. He says joining the Army chaplaincy has given him a new purpose. Chap. SMITH: What an opportunity to be with those young soldiers now as a mentor and as an encourager to give them spiritual motivation. What kind of motto that we have is “we are bringing God to the soldiers and the soldiers to God,” and that is exciting. That’s exciting. That’s a new mission. GONZALEZ: To further serve soldiers, chaplains at this school learn about crisis intervention and counseling. ARMY INSTRUCTOR #2: Here is the scenario. GONZALEZ: Chaplains also learn about dealing with death. ARMY INSTRUCTOR #2: You are the chaplain for the infantry unit, and you have two soldiers who are killed in action as a result of an IED. GONZALEZ: Through mock ceremonies, the chaplains receive instruction in the solemn task of conducting memorial services for soldiers killed in action. The details range from organizing pallbearers to reciting prayers before bodies are sent back to the United States. Chap. SMITH (praying during training exercise): I will say to the Lord He is my refuge and my fortress and my God. In Him will I trust. GONZALEZ: Some chaplaincy students at Fort Jackson have already served tours of duty in Iraq and Afghanistan and have returned for additional training. Chaplain SETH GEORGE (U.S. Army): We lost, in this last deployment, 22. GONZALEZ: Chaplain Seth George has served two tours of duty in Iraq. (to Chap. George): Is it hard being all things to all soldiers at different times? Chap. GEORGE: Oh yeah, it’s difficult, because you will be with a platoon that just lost a soldier. Guys are crying. You’re hugging them. You are trying to talk to them a little bit, and then you literally walk around the corner to another company area and it’s, “Hey chaplain, what’s the word for the day?” And they want to laugh and cut up, just like always, and so to switch gears like that is very difficult, and I try my best to do that. You rejoice with those who rejoice, and weep with those who weep, and that’s part of, I think, the unique element of being a chaplain in the Army. GONZALEZ: Along with all the military training chaplains who attend this school also learn a lesson in religious tolerance, namely, how to uphold the beliefs and practice of their own faiths while also respecting religious differences within the ranks. Col. MCGRIFF: As I say to my students as they first come in here, this is not a Christian summer camp. 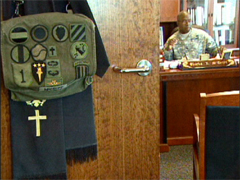 The Army did not call the chaplain into the Army to promote his or her faith. The Army has called the chaplain into the Army to provide for the religious support needs of its members, and its members include men and women of all sorts of orientations. ARMY INSTRUCTOR #3 (speaking to class): Evaluate your opinions very carefully. GONZALEZ: Although students don’t receive formal religious instruction at this school, they are encouraged to learn about other faiths. When deployed, the chaplains will be allowed to perform the rites and rituals of a religion not their own as long as they have no personal objections and it doesn’t violate the doctrines of the other faith. The Army, like other branches of the armed forces, also has no formal rules against its more than 2,500 chaplains evangelizing troops of different faiths, as long as soldiers don’t feel coerced or pressured. Chaplain DAVID DICE (U.S. Army): I am given a lot of freedom to be myself to the soldiers as I minister to them, and as they ask questions regarding their own faith or my faith. They’re coming to me seeking advice. GONZALEZ: Chaplain David Dice, an evangelical Protestant, says he looks forward to talking about his beliefs with interested soldiers. Chaplain DICE: You know, I live out my ministry and what that is as an evangelical, and the Army gives me the freedom to do that. As a soldier comes to me asking questions, that’s when I find full freedom to really share what my personal belief is in God’s word and in that truth that I hold to personally. GONZALEZ: Although the Army recognizes 115 religious groups, about half of active duty chaplains are Protestant. 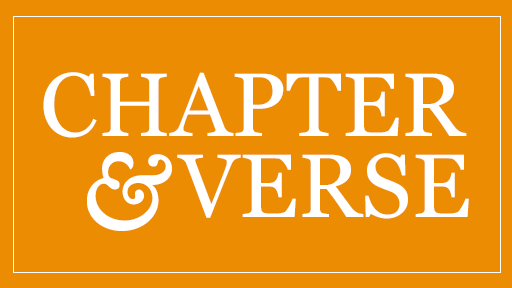 Some people, both in and out of uniform, have expressed concerns about the growing number of evangelical Protestant chaplains in the Army and other branches of the armed forces. They fear it could lead to proselytizing and religious discrimination within the ranks. Col. MCGRIFF: When a person’s ideals or faith orientation gets in the way or supersedes the provision of religious support to all persons, then it becomes a problem. GONZALEZ: Colonel McGriff acknowledges the need for more qualified clergy from a wide range of religions. The Army has set a target of recruiting 350 more chaplains. As for these new chaplains, they’ll soon be putting the lessons they’ve learned at this school into battlefield practice. After graduation, nearly all of them expect to be deployed to Iraq or Afghanistan. Chap. 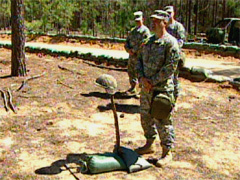 SMITH (praying during training exercise: Today, as we honor our fellow soldiers, may their sacrifice be our motivation. May it be our strength as we continue with the mission that they gave their life for. GONZALEZ: For RELIGION & ETHICS NEWSWEEKLY, I’m Saul Gonzalez at Fort Jackson, South Carolina.